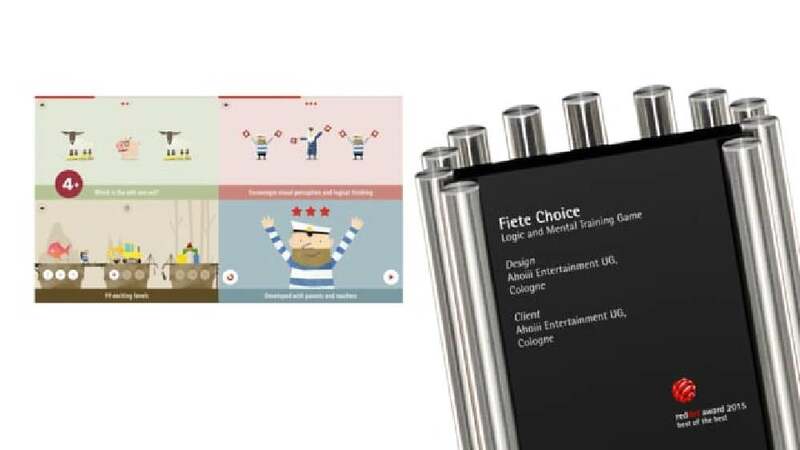 The app “Fiete Choice” is a self-explanatory, intuitive logic and mental training game for pre-school and elementary school kids. It trains the abilities of concentration, logical thinking and, above all, visual perception, as this is fundamental for absorbing, processing and storing information and is also very closely linked with learning to read and write. Featuring animations drawn by hand, the app invites children to accompany Fiete the sailor on his journey from island to island, for which alert young eyes are put to the test. The many levels carefully build upon each other, and players have to help Fiete find out which picture does not fit in the row. If two cows and a pig are shown, the pig is obviously the odd one out and has to be selected by touching the screen. Things get more difficult from level to level so that children have to look closely. Distinctive, child-oriented drawings and charming sounds that make children crack a smile generate a high level of playing fun and learning effect. The highly charming design of this logic and mental training game fascinates because it is intuitive for children to grasp. The complex story line about Fiete the sailor invites players with training tasks that become ever more sophisticated level by level and are fun to solve, whetting the appetite to continue playing. In addition, the app trains cognitive abilities as well as concentration, without being too overtly educational or even moralistic.